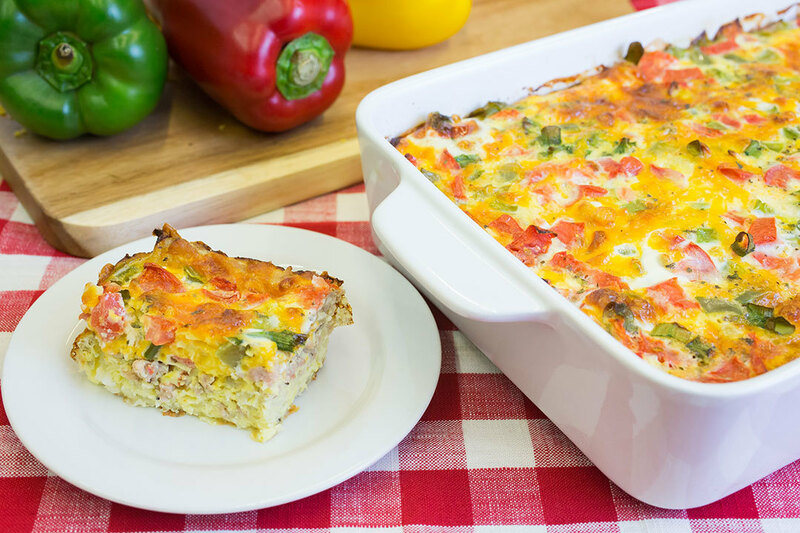 Loaded with veggies, this easy overnight egg bake is deliciously satisfying and healthy, to boot. Perfect for make-ahead breakfasts to feed the whole family. Find more Farmers' Market inspired recipes in our Farmers' Market Cookbook! 1. In a large non-stick skillet over medium heat, cook sausage, onions, mushrooms, and garlic until sausage is cooked through and mushrooms have softened (about 10 minutes). Drain the liquid and set aside. 2. In a greased 9x13 pan, layer potatoes, sausage mixture, 1 cup cheese, green peppers, tomatoes, and green onions. Set aside. 3. In a medium bowl, combine eggs, milk, parsley, salt, basil, and pepper. Whisk thoroughly to combine, then add remaining cup of cheese and whisk again. Pour evenly over ingredients in baking pan. Cover and refrigerate overnight or bake immediately. 4. Preheat oven to 375 degrees F. Bake casserole, uncovered, for 60-70 minutes or until middle is set and edges are golden brown. 5. Remove from oven and cool for 10 minutes before serving. Jumpstart your morning with a fruit smoothie packed with local ingredients.